A man who by the time he died in 1917 had become the most recognisable celebrity on earth. This is the non-fictional account of Buffalo Bill. This details the key events in the life of a truly extraordinary man. It’s about a man of many talents, a man of great moral fortitude in rough times. Buffalo Bill was born William Fredrick Cody on February 26th, 1846 in Iowa Territory (later known as the State of Iowa) to Canadian parents Mary and Isaac Cody. His family were Quakers with strong anti-slavery beliefs, which often got his father into trouble. At seven his family moved to Kansas where his father gave an anti-slavery speech at a trading post, angering the pro-slavers deeply. This resulted in one of the pro-slaver mob stabbing him in the back and William dragging his father to safety. The slavers continued to hound his family until his father eventually died from complications from the stab wound. William rode 30 miles even though he was ill, at the age of eleven to warn his father of a plot he had learned of to kill him. At the age of just eleven he took a job as a freight carrier known as a Boy Extra, riding up and down the length of a wagon train delivering messages. He then became an unofficial scout to guide the army in Utah to stop a falsely reported Mormon rebellion. At the age of 14 he joined the Pony Express (a fast mail service) as a rider. In 1863, he enlisted as a private in Company H, 7th Kansas Cavalry. It was while working for the Kansas Pacific Railroad at about 21 years old that he earned the nickname of Buffalo Bill. His job was to hunt and supply the workers of the railway with buffalo meat and he killed 4,280 buffalo in just eight months. A man named Bill Comstock also became known as Buffalo Bill. Later the two men would have a competition for the title, the man who killed the most buffalo would get to carry on calling himself Buffalo Bill and the other would not. The end score was 69-48 in William Cody’s favour. From 1868-72, he was an official scout for the U.S Army, mostly scouting for Indians, but also hunting for buffalo. In the January of 1872, he was the scout for the highly publicised royal hunt for Grand Duke Alexei Alexandrovich of Russia (General Custer was also in attendance). That year he would travel to Chicago to begin his stage career acting in ‘The Scouts of the Prairie’ written by Ned Buntline, the troupe would last 10 years. Ned Buntline was also the man who had wrote many mostly fictional dime novels about Buffalo Bill, catapulting William into his initial fame and stardom. Also that very same year he was awarded the highest decoration given by the American government, the Medal of Honor. However too much disgust, in 1917 not long before his death the government revoked his Medal, after they changed their policies (he was classed as a civilian scout and not an army scout as was required under the new policy). His Medal of Honor would not be reinstated until 1989, 72 years after his death. On July 17th 1876 not long after the Battle of the Little Bighorn (Custer’s Last Stand) William would have an immortalised fight to the death with Chief Yellow Hair, with both men charging at each other on horseback looking very much like two knights at a medieval joust. It was at this fight that William would cross a line he could never come back from, after having shot and stabbed Yellow Hair he proceeded to scalp his corpse. This would later become the basis for a play entitled ‘Buffalo Bill’s First Scalp For Custer’. It was with this single act that William F. Cody the man was gone and all that remained was Buffalo Bill. In 1883, William founded ‘Buffalo Bill’s Wild West’ in Nebraska. It is a common fallacy that it was entitled Buffalo Bill’s Wild West Show, however, he chose not to include ‘Show’ in the title as he felt it implied fakery or fraud. The event later extended its title to ‘Buffalo Bill's Wild West and Congress of Rough Riders of the World’. "If any lady wishes to behold one of the most perfect and handsome specimens of manhood in existence, she will have to go and see William F. Cody"
- Rochester Morning Herald, 1879. As he intended the events to be as authentic as possible, it incorporated real world horseback riders including Turks, Mongols and Arabs, plus famous western personalities such as Sitting Bull and Anne Oakley. Re-enactments included the Pony Express, Indian attacks and Custer’s Last Stand. Thomas Edison (inventor of the light bulb) would met William more than once and end up recording both Buffalo Bill's voice and filming some of the Wild West Show. 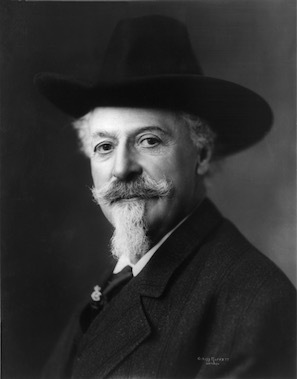 In 1887 with the profits he had already made he was able to buy the 4000 acre (only 16 acres remain) ‘Scout’s Rest Ranch’, now known as ‘Buffalo Bill Ranch State Historical Park’. In 1886, he built an 18 room Second Empire architecture mansion and large barn on the ranch. In 1887, he took ‘Buffalo Bill’s Wild West’ to Britain in celebration of Queen Victoria’s Golden Jubilee after the Queen requested the presence of the event at Windsor Castle herself. The entire troop of 200 passengers, 97 Natives, 18 buffalo, 181 horses, 10 elk, 4 donkeys, 5 Longhorns, 2 deer, 10 mules, and the deadwood stagecoach crossed the Atlantic on several ships. a splendid man, handsome and gentlemanlike. It proceeded to tour London, Birmingham, Salford, Manchester and later Scotland. Two years later in 1889 he would tour Europe, meeting Pope Leo XIII in 1890. The Wild West Show would tour Europe a total of eight times. It was mainly thanks to his “Wild West Show” that it is believed that by the beginning of the 20th century he was ‘the most recognisable celebrity on earth’. In 1895, he founded the town of ‘Cody’ in Wyoming, which nearly bankrupted him at the time. He helped in the creation of the nearby ‘Shoshone Dam’, which at the time of its completion in 1910 was the largest dam in the world. Nearly 30 years after it was finished being built, it was renamed by order of Congress to honour William, it is now ‘Buffalo Bill Dam’. Also in Cody is the well-known Buffalo Bill Historical Center. Despite the stereotype of him being a rough outdoorsman, he was very moral and fought for the rights of Indians (for example he was paying Native Americans a salary about 30 years before they were even considered citizens) and women and was a conservationist for much of his life. He would spend much of his later years with the Indians and would teach them to read and write. One tribe in return taught him their language. William played himself in three short silent films, first in 1895 then in 1911 and 1914. Actors would also go on to play as him in many film and TV roles most famously ‘Buffalo Bill’ in 1944 starring Joel McCrea and Maureen O’Hara. In 1905, William filed for divorce causing a huge scandal. During the proceedings he never spoke ill of his wife, however, the same cannot be said for Louisa. His lawsuit describes her as a nag who had threatened his life and her counter suit cited infidelity on William’s part as the cause for the bad marriage. Soldiers testified that his great lust for women dated back as far as 1869. They claimed he had slept with Indian maidens and had frequented ‘houses of ill repute’, an accusation that many find hard to believe. He had agreed that if she gave him a “quiet, legal separation” he would give her Scout’s Rest Ranch and an annual income. But she had other plans stating, “I will bring you so far down the dogs won't bark at you”. Never the less the judge ruled in his wife’s favour and denied William the divorce. Locking him in a bitter loveless marriage for the rest of his life. However, this does not necessarily mean there was never any love between them, six years after the divorce trial their only surviving daughter decided to put them into a room together so they could work things out. When they had finished they seemed to have worked much of their problems out of their systems. This is not the most evident part that shows they cared about each other. It is if you pay attention to their photographs you can notice something subtle but very telling, in most pictures he wore a large horseshoe shaped watch fob, but in photos after that meeting you can see she is now wearing it around her neck, and she continues to do so after his death. Due to many bad investments he had lost a great fortune at least three times. This meant he was forced to carry on working for the rest of his life, even to the point where he would be backstage at his Wild West Show aged 70, appearing to be clearly mentally and physically a tired old man, then just to have to jump out on stage acting like a 20 year old again, he would then when finished, go backstage and quite literally collapse to the ground. As he lay dying in his sister’s home, scouts stood guard on the porch and the world waited eagerly for any news. Buffalo Bill died of kidney failure on January 10, 1917, aged 70. The news quickly broke of his death, over 20,000 people lined the streets to pay their respects and he received tributes from King George V of the United Kingdom, Kaiser Wilhelm II of Imperial Germany, and President Woodrow Wilson, of the U.S.A.
His body lay in state and essentially he would receive a state funeral. More than 100 people including cowboys would follow his remains to their last resting place. Truly a burial fit for a king. The Oglala Sioux Indians of Pine Ridge, South Dakota, in council assembled, resolve that expression of deepest sympathy be extended by their committee on behalf of all the Oglalas, to the wife, relatives, and friends of the late William F. Cody for the loss they have suffered; that these people who have endured may know that the Oglalas found in Buffalo Bill, a warm and lasting friend; that our hearts are sad from the heavy burden of his passing, lightening only in the belief of our meeting before the presence of our Wakan Tanka in the great hunting ground. He was buried atop Lookout Mountain in Golden, Colorado by his wife Louisa despite his will stating he was to be buried overlooking ‘Cody’ the town he founded and loved. This has created a great controversy that has lasted to this very day. William F. Cody was not just an American scout, bison hunter, politician, prospector, entrepreneur, filmmaker and showman, but arguably the greatest American that ever lived. He was the kindest, simplest, most loyal man I ever knew. He was the staunchest friend. He was, in fact, the personification of those sturdy and lovable qualities that really made the West, and they were the final criterion of all men, East and West. Like all really great and gentle men he was not even a fighter by preference. His relations with everyone he came in contact with were the most cordial and trusting of any man I ever knew.